If in doubt, phone or email me. This course may not be suitable for people with long-term or severe mental illness, or who have regular experience of psychotic or severe anxiety episodes, or who are dependent on illegal drugs. If you are on any prescription drugs please let me know. It is essential that you discuss any illness of this kind, or treatment you have had, with me before enrolling. This may not exclude you from doing the course, but I’d need to know about it so that we can be sure the course is right for you. There is no hard-and-fast rule about this: for example, if you are prone to long-term mild depression but your life is in reasonable order there should be no problem in your doing the course. Please however contact me first to discuss. I need to know about relevant physical conditions or incapacities as well, and any special requirements that these may involve. If in any doubt please phone me first so we can discuss if the course is for you. I usually set a lower age limit of 21 years old minimum. If you are a little younger but wish to do the course, please phone me to discuss this. Who is this course (and co-counselling) for? Who is it NOT for? 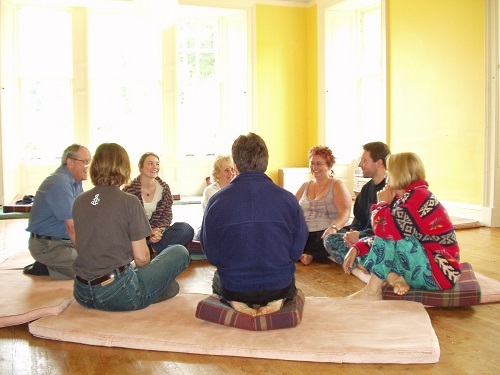 Co-counselling can be of use to anyone who is already functioning reasonably well in some areas of their life (i.e social relationships, partner relationships, work and career, home/acommodation), but who wants their life to be more colourful, productive or fulfilling, and who has some areas where things are not going as well as they’d like. It’s for people who want to reflect on the questions: ‘who am I – what makes me tick – how come I am the way I am – do I need to do things differently?’ It’s for people who want to explore these questions and who don’t mind the idea that they may discover areas that are uncomfortable or unpleasant and need addressing. It is for people who are willing to share personal experiences and listen to other people when it’s their turn. Co-counselling is probably not for someone who is living in chaos in all areas of their life, and not for someone who risks having a psychotic breakdown (getting out of touch with reality) when they contact uncomfortable feelings. Co-counselling does not replace work with a professional therapist: it should be seen as an additional and complementary way of therapeutic working. It is not suitable for people who are dependent on statutory or voluntary sector services for emotional support or who are prone to psychotic episodes (i.e. emotional breakdown accompanied by lack of awareness of reality). Diversity: this course, and CCI Co-counselling, is open to anyone irrespective of religion, race, sexuality, politics, disabilities, height, or any other defining personal characteristics you can think of (except age – see the pre-course information). …that the course is for you please phone me for a discussion about any questions you may have. Some people come onto my courses on personal recommendation by other co-counsellors, but if I have not been recommended to you, you may be wondering what it’s like to be on a course led by me. You are welcome to meet me in my office in North Leeds, or on Skype, if you wish, for a chat about the course. A well planned and organised course that will equip participants to be accepted as a co-counsellor within the Co-Counselling International (CCI) network. The syllabus will include all of the co-counselling interventions and styles of working within CCI. 100% attendance on the timetabled sessions. If exceptional circumstances prevent this I may possibly be flexible on this point. Any planned absences must be discussed with me before the first day of the course. Your doing at least two 40-minute (2 x 20 minutes) practice sessions between the two taught weekends. You will be supported in arranging this. Participating in two phone calls during the course with your review partner (who will be another course member), to discuss how you are getting on with the course. An understanding of and basic competence in the co-counselling method. You will be taught this on the course. Spending time reading the whole of the written manual (which may take about 2 – 5 hours) outside of the timetabled sessions, and before the final course day.